Have you been looking for someone to trust with Melasma treatment? look no more! We are Edmonton #1 clinic for Melasma removal. Melasma is a small word for a big problem!!! We know because we helped lots of patients to restore the even color of their skin. We heard lots of stories of clients describing their despair as they deal with melasma every time they take a selfie or go for a family event. Melasma is very annoying as it is not stable and unpredictable. It gets darker at worst timing when stress and hormone levels are high. Why do we get Melasma? Melasma has been a cause for severe social and emotional stress to patients. 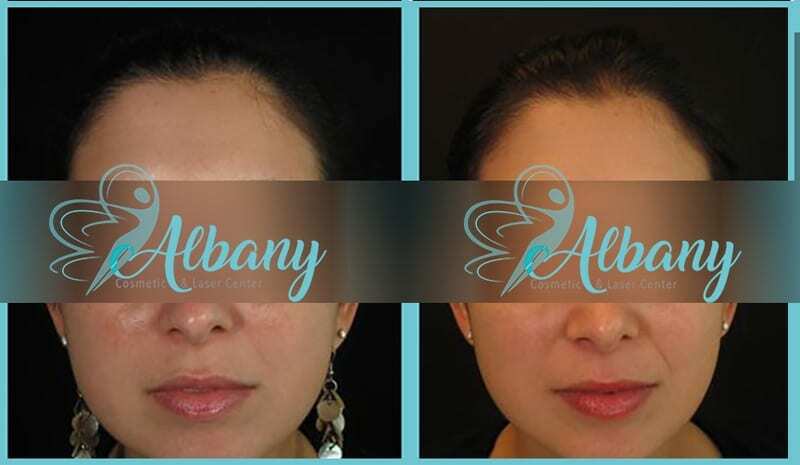 Melasma removal and Melasma treatment are very tricky and harder than other hyperpigmentation issues. Do you want to know why you are the one with melasma? the simple answer is because you are type IV Sking and you have uneven production of pigment. However, the real riddle is what causes it to be uneven. To provide more information, we need to study more about the skin layers. Let us take a look at a diagram of the skin; there are three layers; the fat tissue under the skin which caller the subcutaneous fat, this layer has a lot to do with the overall contour of the face, it has nothing to do with the discoloration of the skin. The next layer is the dermis. It is the thickest layer of the skin and it hosts most of the glands, blood supply, and the collagen matrix of the skin that give the skin its strength and elasticity. Even though very important in its function, however, it does not play any role in the hyperpigmentation and melasma. It is a thin layer of epithelial cells (skin stem cells) on the border between dermis and epidermis. These epithelial cells multiply to provide, virtually, an unending supply of skin cells (keratinocytes). New keratinocytes push the old ones, therefore, there is a continues migration for the keratinocytes from the epithelium to the skin surface, this pushes the old skin and provide a new skin. We refer to this as skin resurfacing. On the other hand, the pigment-producing cells (melanocytes) locate net to the epithelial layer and provides the pigment color (melanin) the skin cells and outer skin color. The melanocytes produce packs of pigments and send it to the keratinocytes, so by the time they get to the surface they are filled with appropriate amounts of pigments that give the skin color. This pigment is important to protect us from sun radiation, and the amount of melanin production is controlled by genetic programming. The problem starts when the production of pigment starts to be uneven. There are six known skin types according to the melanocytes activity and sensitivity. Skin type 4 is the main skin that suffers from melasma most of the time. The melanocytes are very sensitive and are on a fine balance. Some factors such as sun and change of hormones can easily tip the balance of the melanocytes level. The problem is mainly when some melanocytes go back to the normal level of productions, yet some skin area is under the influence to produce more pigment. This results in uneven skin color and melasma. Let us go back to why we get melasma? Think about it as a house with many rooms and each room has a thermostat that controls the heat. At one point, it is cold at all rooms and the thermostat will work on producing more heat (pigment), one we have the rooms are warm enough (having enough pigment) the thermostat supposed to stop the pigment production at all the room together. So what is after that? The problem is one of the room thermostats is not work out of the group. Therefore, we will end with one room only that is hot (or really dark). If we open one window, the room will heat down, but once we close it, we will end up with a hot room again. Therefore unless we are able to reset the thermostat, we will keep having the problem, that is why one treatment of melasma is usually not enough, and we need a full protocol to reset the melanocytes. We have some good news and back news. The bad news is that no single treatment or pill that you can take to treat melasma. 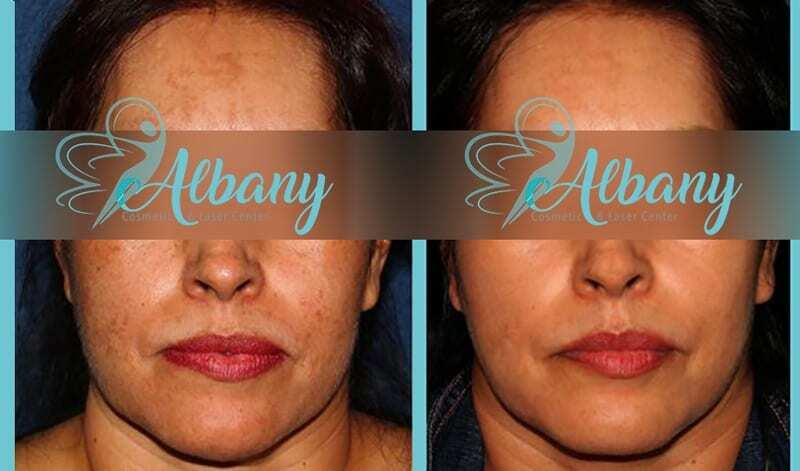 The good news is that we can help you by designing a tailored protocol that takes into account your skin types, melasma trigger and the type of melanin. However, every melasma protocol has some kind of laser. Melanin pigment absorbs all the laser energy, which will heat and cook the melanin (result in some changes in the chemical structure). Our immune system recognizes that this melanin is not good anymore and starts to get rid of it. It has also shown that laser can reset the melanocytes thermostat and restore the balance. Choosing the wrong laser may results in activating the melanocytes (remember they are very sensitive), this will result in melasma getting worse. Therefore, it is substantial to choose the right laser, power and plus width. Why choose us for melasma treatment? Albany Cosmetic and laser center has the biggest laser selection in Edmonton to fit every skin type. Our staff helped hundreds of Edmontonian to treat their melasma and restore their skin tone and color. Despite the fact that lots of treatments or procedures exist, managing melasma treatment and pigment continues to be a serious problem. This is because of their refractory and recurrent nature. But the introduction of laser technology has become a welcome relief as it offers numerous treatment options for dermal or mixed pigmentation. 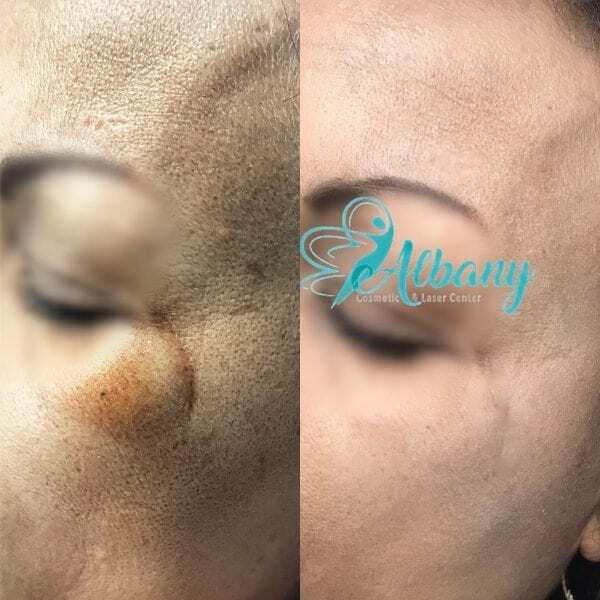 Laser treatment is one of the most remarkable procedures for getting rid of unwanted pigmentation on the facial skin. The high-energy laser beam penetrates the target area and heats up the melanin within the skin cells (melanin is the pigmentation in our skin and extra melanin is the cause for Melasma and pigmentation). What Laser wavelength do we have? The wavelength of the Spectra Laser Nanosecond Q-switched comes in four distinct forms: 532 nm, 585nm, 650nm, as well as 1,064 nm in nanosecond pulses (specially designed for melasma treatment and melasma removal). The targeted melanin is wasted as the body to heal. The pigment may darken to some extent while the human body gets rid of the pigment. The procedure is mild from start to finish and is considered safe for use. This is why numerous passes are used to treat melasma as well as other skin disorders. The cost of Spectra Laser Nanosecond Q-switched in pigmentation cost between 200-400 per session. But prices may vary from one location to another and on the size of the target area. How deep the pigment also affects the cost of the treatment. Additionally, if you want to enjoy maximum benefits from the treatment, you will need to go for approximately four to six sessions. The procedure must be spaced three weeks apart. You should avoid exposure to the sun for about four weeks before the treatment. On the day of the procedure, you should wash exhaustively with soap and do not wear any makeup. Your dermatologist will counsel you as to what you should expect. This is where you should tell your doctor if you have any history of allergic reactions to topical anesthetic or any medical condition.